Our family of 5 (3 kids ages 13, 15 and 17) had a fabulous day with Massimo during our stay in Monsummano Terme. He met us with 5 bikes at our Airbnb home we rented and spent a full day touring the northern Tuscany region. We had a fabulous lunch at a winery! We would highly recommend Gusto Cycling!! We are preparing to head to Sienna this morning and wanted to express our appreciation for the fabulous program you put together for us. The biking routes were excellent and each very different than the other. We especially liked the final day. Three of us did the extra loop and loved wandering through the small towns on back roads. The e-bikes were also a perfect suggestion and made the riding very accessible and enjoyable. We were so pleased with all of your arrangements. The lodging worked very well and of course each place was lovely and hospitable. For us, Fattoria San Donato was by far our favorite place. We loved feeling like we were with a family, Frederica was delightful and so funny. We loved the animals and the fact we were in the middle of the farm. The other two places were of course beautiful and somewhat fancier, but we really enjoyed the feel of San Donato and were happy to spend two nights there. The family style dinner remains one of our highlights. When we are back home we will be sure to post some reviews on your site and encourage our friends to use your services. I hired a road bike for a week while staying in Viareggio. The bike was excellent and the service superb. The bike was delivered to my hotel along with spare tubes and CO2. I managed almost 300 miles of acclimatisation riding in the heat thanks tom these guys. Nothing too much trouble including a last minute change of delivery address. Will definitely use them again. Thanks guys. My wife and I arranged a non-guided cycling trip from the USA with Marco via the Internet based on his reviews and knowledge of the area. We specified some basic criteria i.e. miles per day, type of bikes, general area and level of accommodation (pools a must). We started the trip by flying to Rome and catching trains to Arbia where the taxi Marco had arranged met us and took us to our first hotel. We collected our bikes (brand new carbon racing road bikes (as we specified). Marco provided backup telephone numbers for his staff should we have any mechanical problems while we were on our rides. We could not be more pleased with what we experienced. It truly was a trip of a life-time. Marco’s communication via email was flawless, his ability to alter the plan to match our changing needs and his suggestions were spot on. Our accommodation (5 hotels between 3 and 4 star) were superb, the staff were excellent, the food superb and hospitality was beyond. Between Arbia, San Quirico, Montepulciano, Pienza and Rhadda we saw the most beautiful countryside, stunning villages and cycled along roads lined with vineyards and olive groves, which were purely idyllic. Cycling in Italy can be anything from Strada Bianchi tracks (tough) to single lane country lanes and Marco can tailor the routes to suit your ability. We had the best lunches and most amazing Cappuccinos I have ever had (and we have traveled a lot). Marco also enabled us to download turn by turn routes via our iphones through “RidewithGPS” before our trip started, which meant we never got lost and each mile/ meter we knew exactly where we were, the gradient, the speed, distance to destination etc. We finished our trip with a day in Siena (stunning) and 2 days in Florence which Marco recommended hotels for. I would book with Marco in a heart beat the next time we travel to Tuscany – and we will!!! Grazie mille Marco – 10 out of 10!!!!!!!!!!!!!!! We had a wonderful time! We were really satisfied with the service of Gusto cycling. Everything was so well prepared and the bikes were perfect. I’d be happy to make a recommendation on your site if that helps for you, let me know where to enter it. We will definitely contact again if we come back to Tuscany and recommend to friends. One of the highlights of out trip. Hello Marco, thanks for your interest. We are all very satisfied! Perfect delivery on time, material very well maintained (holder for drinkbottles were of less quality), prices, pedals etc all was in place as agreed. Sorry for the delay, we are back into work flat out! Our feedback is that Gusto cycling was fantastic. We had done a lot of self-organised cycle trips before but having all the hotels and routes organised made for a much more relaxing holiday experience. All the hotels and the Agri-turismo accommodations were wonderful, and I do not think that we would ever have been able to find such unique places ourselves. The GPS routes worked well. We did have some problems on one route with very busy roads – but after contacting Marco our routes were re-arranged and were fine; Bile hire was hassle free and the bikes (including a fantastic electric bike for Sam) were brilliant. We would thoroughly recommend Gusto cycling. Yes, it was perfect. We loved the tandem bike, and everyone at the bike shop was very nice and helpful! Even though it was 40-43 degrees that week, we had fun cycling around the Toscana. We will keep you in mind the next time we are traveling. Yes, it was hot and as a result we curtailed our routes to what we were comfortable with. And started earlier in the morning. The bikes were great and we had no issues at all. The Podere was incredible. One of the nicest hotels that we have ever stayed at. The last time we were in Tuscany, my husband and I stayed at Borgo San Felice (Relais et Chateau) and the Podere was even more beautiful. The staff were amazing, food delicious, pool was beautiful, tennis courts well maintained. The pool was a saving grace given the heat. The routes that you provided look amazing and it would be nice to go back and attempt them with less heat. We ended up visiting many of the little towns by car instead. We would (and already have) recommend that our friends use both you and the Podere. Thanks for helping us bring this trip to life! We had a great holiday and a great experience with Gusto Cycling. The bikes were ready when we arrived at the shop and the bikes were of perfect quality. Aiko d B – from the Netherlands’. Thank you so much for organising our visit to Tuscany. We all had such a great time. The weather was perfect – not too hot for cycling and very little wind which helped. The climbs were a bit steep at times but we all coped OK although having an electric bike certainly helped my friend David and I on the last day. All the hotels were really good and I would be happy to recommend them to any of your clients. We ate at La Perla which was the hotel restaurant in Radda on the first night which was great and the second night we were treated to a wine tasting by Pietro who owned the hotel in Colle di Val d’Elsa. The last night we were serenaded by a very handsome Italian waiter by the name of Benedetto who took a bit of a shine to my wife with a bit of encouragement! We spent the last day in Sienna and your friend Andrea met us right on time and got us back to Pisa in plenty of time. Thanks once again for all your help and hope we can visit Tuscany again in the not too distant future. Hi Marco. Hope all well in sunny Sheffield. Actually we didn’t have great weather in Tuscany,as you know-serious rain on the Saturday en route to San Gimignano but we had our waterproofs. it was excellent , we did have a great week and all the coordination with Massimo was perfect. 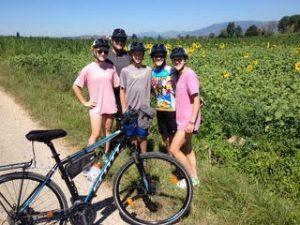 We really enjoyed our cycling in Tuscany. Both hotels were great. They were different offerings but both provided excellent customer service with very helpful staff. And the towns were different and also provided a different experience. We were very happy with the bikes – especially as neither had a flat!! They were good quality and nice and light. The routes suited us well. Had a few elevations without any difficult hills. Overall your offering was really good. Thanks for the lovely cycling escape and perhaps we will use your company in the future. A great, hot, week but everything went to plan and bikes and service were excellent. I was very impressed with the service and the product at Cicloidea. It was smooth, helpful and straightforward process, and I really liked the Formigli bike. Which all meant I had an excellent few days of biking in and around Montecatini Terme. We thoroughly enjoyed our holiday & the team @ Gippo was excellent, very happy with their selection of bikes, advice & assistance. We had a very nice experience renting bikes at your shop. The Formigli carbon bikes were in a very good condition and we had no problems with them during our four day rental. I will definitely consider renting bikes with your when I visit the area again. The cycling was fantastic! Very happy with everything, it was great. The bike was great and the guys at the shop were wonderful to deal with. I was more the satisfied! Only issue I had was finding the shop, they need a sign outside. Yes everything went great! Federico did a good job! And nice bikes with no problems. Hope to be back one day. Thanks for good service. The service at the bike shop was really great and I fancy the name a lot! Also, the bike was amazing, it being a local brand is appreciated in particular, never rode a Formiglia before. Collection went also punctual and smooth, thanks for arranging it. The bike was excellent and setup perfectly. appreciate the help, and hope to be back! Yes, the staff at bike shop were excellent – very helpful and friendly. Great experience all around. The bike was great and the guys at the shop were very friendly and helpful. The bikes we’re good en we had a very good service!